Sumida River Toro Nagashi is one of popular Toro Nagashi in Tokyo. It is a has about 3,000 lanterns float every year. 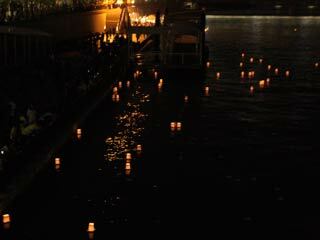 Floating Lantern on a river, is one of popular event during Obon. Sumida River will be light up beautifully with those lanterns. This will happen at Sumidariver. On Azuma Bridge is the best view to see those Lanterns. It happen during the middle of August at Sumida River. You can join Toro Nagashi. Visit Asakusa Tourist Organization and sign up for it. It is 1,000 yen (in 2011) to join.